Who doesn't like barbecued chicken? I'm sure that there are a few freaks out there, but most of us love it. Here's a fresh spin on the familiar backyard favorite. My girls frequently ask me what's my favorite thing to barbecue, and I always answer, "Chicken!". After they ask me that familiar question (why can't they remember?) I usually ponder why chicken is my favorite meat to barbecue. The only honest answer is that I just don't know. The most prominent reason that comes to mind is the years of my youth when I used to hang out at the grill with my maternal grandfather as he grilled chicken that I can taste in my mind to this day. This is a recipe that I found scrawled on a piece of paper from probably 15 years ago. Back then I wrote very few recipes, so it was almost a quasi-nostalgic thing when I found it. Of course I couldn't leave well enough alone. I simply couldn't resist the urge to tweak it. As I put this sauce together I thought that it's almost a French version of a typical American barbecue sauce. It has many of the familiar base ingredients, but it brings a new twist to the table. My girls gave it great reviews, and I think you'll dig it. Here's what I came up with using my inspirational blast from the past. Heat the olive oil in a medium sauce pan over medium heat until it just starts to shimmer. Add the shallots, garlic salt and pepper to pan. Cook 3 minutes, stirring occasionally. Add the sherry and vinegar to the pan. Increase the heat to medium-high and cook 5 minutes. Whisk the mustard, tomato paste and honey into the pan. Reduce the heat to medium and cook another 5 minutes, stirring occasionally. Remove the pan from the heat, stir in the butter and thyme, and let cool. 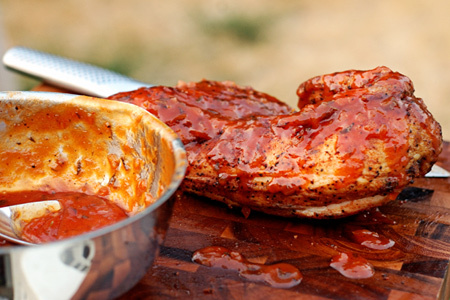 Drizzle or brush on your favorite grilled or barbecued chicken just prior to serving. Gorgeous pics, John, and a great spin on the sauce. Pinning this to try out soon. Thanks, Chris. It really was a welcome change to traditional American BBQ. Looks delicious! 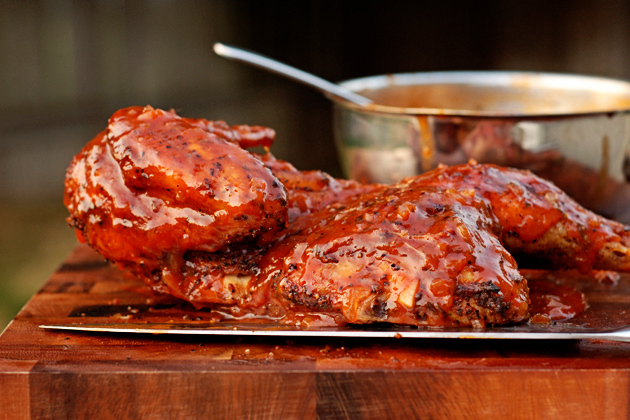 I wish I had some BBQ right now, the sauce just looks fantastic. Tia - I am so happy that you enjoyed the recipe, and I appreciate your kind comment. 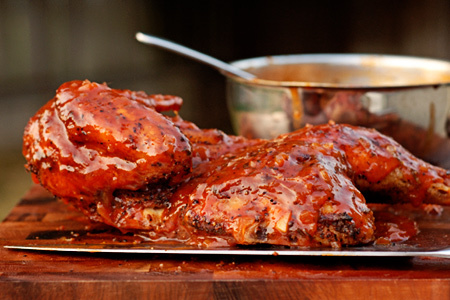 Amazing variation in BBQ chicken. This BBQ glazed chicken is making me hungry. Thanks for this recipe. This chicken looks absolutely delish. I love the ingredients in your sauce. My 2 yr old daughter absolutely inhaled this chicken, I think she was done before my wife and I even took our first bites.